The 69th annual Miami International Boat Show and Strictly Sail Miami opened Thursday and organizers are hopeful boat buyers will be out in full force. "I think we&apos;re expecting a good show. I think we&apos;re expecting more people than last year," Thom Dammrich, president of the National Marine Manufacturers Association, told Soundings Trade Only. "Because it&apos;s a little bit smaller than last year, it&apos;s going to seem like it&apos;s much more crowded." Around 2,000 exhibitors are on hand for this year&apos;s show, down around 200 from 2009. Many of the NMMA&apos;s shows have been smaller this year, but that&apos;s not necessarily bad - smaller footprints mean more dense crowds, Dammrich said. "That just creates a level of energy at the show that we haven&apos;t seen in a few years," he said. "I think most dealers are reporting good sales at the shows - not everybody, but certainly there seems to be a lot of activity in smaller boats, and we&apos;re getting a lot of feedback that dealers are seeing the first-time boat buyer again that they haven&apos;t seen for three or four years." Last year, 96,736 people attended the Miami show, down 26 percent from 2008. The NMMA is expecting more than 100,000 attendees at this year&apos;s event, which runs through Monday at the Miami Beach Convention Center and the Sea Isle Marina & Yachting Center. 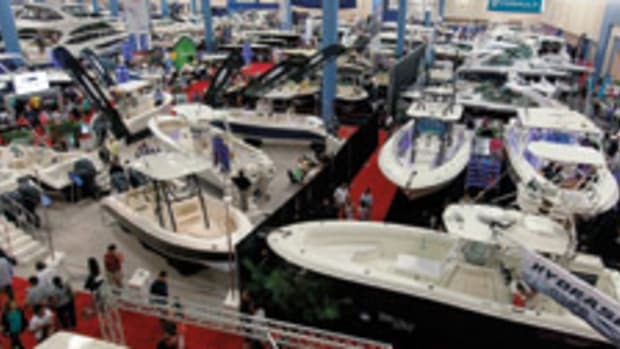 The 22nd annual Yacht & Brokerage Show runs concurrently with the Miami show. Both shows run through Monday, Feb 15.